History : Steuben Glass Works is an American art glass manufacturer, founded in the summer of 1903 by Fredrick C. Carder and Thomas G. Hawkes in Corning, New York. Hawkes was the owner of the largest cut glass firm then operating in Corning. Carder was an Englishman (born 18 September 1863) who had many years experience designing glass for Stevens and Williams in England. Hawkes purchased the glass blanks for his cutting shop from many sources and eventually wanted to start a factory to make the blanks himself. Hawkes convinced Carder to come to Corning and manage such a factory. Carder, who had been passed over for promotion at Stevens and Williams, consented to do so. Steuben Acid Cutback - Technology used in calcite shades where the color of one glass is shown through the different color of the second piece of glass when they are cased together and then acid etched. 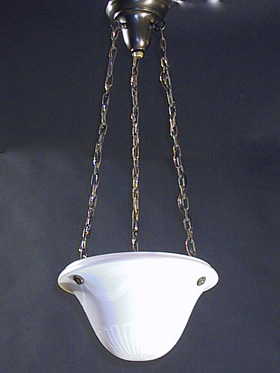 This wonderful antique light has an iridescent glow and would be well placed in a small library, bedroom, or foyer.